Unbeatable accommodation on a fantastic quiet, luxury complex with large pool, mature gardens and with all amenities within close proximity. Ranked in the top 5 places to stay in the Peyia region and in the top 15 places to stay in the Coral Bay Region show you the quality of this property. Lots of repeat custom to the house gives you the confidence that you will not be disappointed. Newly installed WI-FI facility means you will never be out of touch and now with satelitle tv for you to watch. The uninterrupted View out to sea from the Balcony is fabulous and the ideal way to relax and take in the summer sun at any time of the day. Sleeps 5 (inclusive of cot). 2 large bedroom house with private terrace and balcony, set in a quiet, small development with landscaped gardens, large shared pool and stunning sea views over Coral Bay. If you require larger accomodation then we do have contact with other owners to facilitate this. Located in the town of Peyia with shops, bars and restaurants only a few minutes away, and Coral Bay 5 min away. The newly furnished accommodation comprises of a spacious lounge/diner, a fully fitted kitchen with modern appliances, 2 large double bedrooms with fitted wardrobes, a modern family bathroom with shower over bath and separate WC. washroom. It benefits from air conditioning throughout which is included in the rental price, a pressurized water system, and is fully serviced with electrical items such as TV, kettle, toaster, microwave, iron etc. This is a small quiet complex offering a haven for a relaxing holiday in clean and modern accommodation. There is plenty of space on the complex so it never feels overcrowded. With excellent facilities and convenient location, this offers an ideal spot for couples and families alike. We provide garden furniture and a barbecue, and other home comforts to hopefully make your stay as enjoyable as possible. Travel cot available on request. A TV is also installed to keep up with all your favourite UK programs. Unfortunately pets are not allowed. Non-smokers are preferred. The terrace, balcony and complex are predominantly south-west facing and therefore benefits from sun all day long. The complex has a large communal swimming pool and adequate bathing areas with sun beds and parasols provided for use by the residents. The landscaped gardens are attended to weekly to ensure they remain clean and tidy. Lighting is provided at night to illuminate the pool, pathways and entrances. Skiing is available in the nearby Troodos mountains during the winter season (Dec - Mar) weather depending of course! Jet 2 / Ryan air and EasyJet flights from Manchester/Leeds Bradford to Paphos available now as well as many low cost airlines for airports across europe. Travel from Paphos airport to the house takes approx 25 - 30 min by taxi or hire car. You will travel through Paphos and up the coast road via the Tomb of the Kings, Kissonerga and on to Coral Bay. Driving is easy in Cyprus (on the left as in the UK). Car hire is not essential but is recommended. Peyia is ideally located for easy access to the resort of Coral Bay where there are a wide variety of modern shops, contemporary and traditional restaurants and local amenities, including facilities for young children. Fully fitted, tiled family bathroom comprises of a bath with shower over, washbasin and WC. There is a mirror, towel rail, storage, and a shaving point. Pressurized water is heated using solar energy however there is a back-up electric water heater. Fantastic views across the bay and out to see make it a perfect setting for an sunshine breakfast or later evening glass of wine. Fantastic size pool and perfectly safe for children. Plenty of sun loungers around the pool and shower / toilet available. Never busy so a quiet way to relax or for children to play in safety. Great villa, has everything you need and in a superb location. Lovely and quiet, had the pool to ourselves a few days and was only a short journey down to the famous coral bay beach. Villa was very clean and tidy, the outside area, garden and pool are also very well kept. Overall we had a great holiday will be returning next year indefinitely. We are so pleased you enjoyed your stay Thomas and look forward to welcoming you again next year. Just back from a fantastic family holiday, the house is home from home with everything you could ever need, it's set in the most beautiful gardens with a fantastic swimming pool that has plenty of sunbeds available. Very close to some lovely family run restaurants, that serve great food. The beach is close by but a car is essential. Would 100% reccommend this house to anyone, we had a perfect holiday! Thank you for your comments and we are so pleased you enjoyed the house and your stay. The town house is really nice located in a peaceful location with beautifully landscaped gardens. Ideally located for the local restuarants and night life if that's what your looking for but far enough away so if you want peace and quiet you have that as well. The house is well equipped with an adjacent parking space. A great location with everything you would require. Thank you Carl, hopefully will be visiting again. Thank you Wendy for the review. We are so glad you enjoyed your stay in the house and hope to see you again soon. Great location, house and pool complex. Thank you Mandy for your comments and we are delighted you enjoyed your stay at the house. 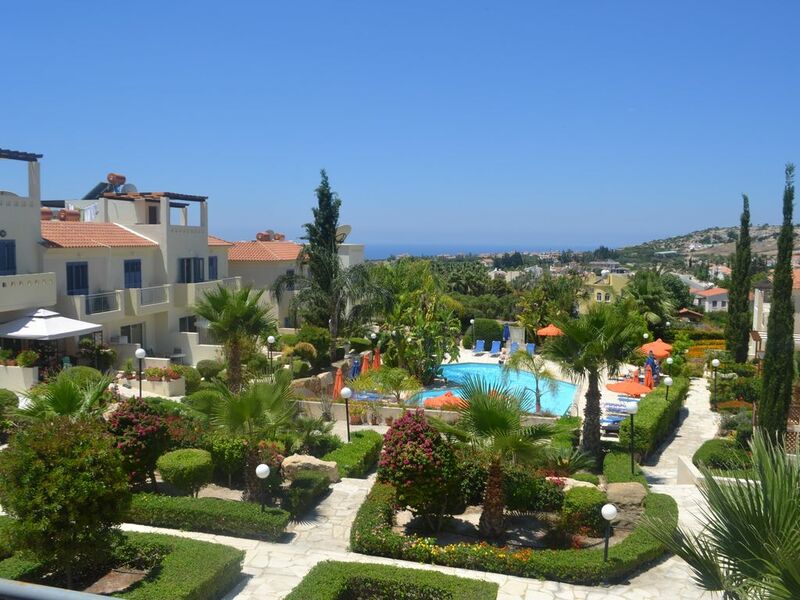 Having been to Peyia and stayed in another property in Irini gardens we knew what to expect. We weren't disappointed. House was comfortable with all amenities you would expect plus more. The only thing missing for us was a safe for our valuables. Was a little bit concerned about leaving money and passports etc in the house although the door and windows had good locks . The tv programmes are streamed so uk channels buffer(a lot). Ok watching the sky network channels though. All in all was a nice house. Nice to sit on the pretty patio and also the upstairs balcony to watch the sun go down. BLISS! I am so pleased you enjoyed your time here. Many Thanks for your booking and we hope we can welcome you again at some point. Peyia is a small village located just outside the resort of Coral Bay and all amenities are within close proximity. It is a 30 minute drive from Paphos Airport and the house is situated near a very picturesque village. It is perfectly located to explore the local area and has all amenities required within either a short drive or walk. Whether you want a beach, activity, ski or golfing holiday the local area and amenities appeal and cater for all needs. It is a beautiful part of Cyprus and has everything you need on your doorstep for a fantastic holiday. The resort of Coral bay is within 5 minutes and has a wide variety of modern shops, contemporary and traditional restaurants and local amenities, including facilities for young children. It is rarely over crowded even at the peak of summer which allows you to enjoy yourself at your own leisurely pace. The stunning beach is a 5 minute drive from the house at Coral Bay, or Corallia Beach which is next door has better facilities for children and has a quiet but enjoyable feel to it. The village of Peyia is also self sufficient with a variety of restaurants and bars to chose from. It also has local supermarkets, banks, bakeries, butchers, pharmacy and all your modern day requirements including Free WI-FI in most places now. The Peyia tavern is a delight offering a 8 course tapas menu and all restaurants and bars are child friendly.